Chief is proud to support the Rensselaer Polytechnic Institute Motorsport team with their Formula SAE Vehicle Project (RM24). Chief supported the project as one of the team’s main sources of electrical components — supplying connectors, terminals, sensors, and more. 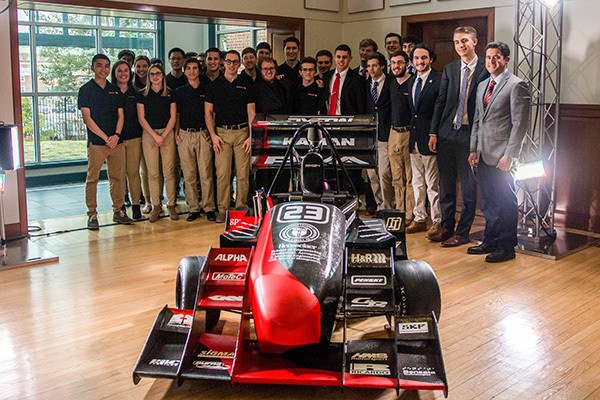 The RM24 project was born when a design team of Rensselaer students were eager to develop a small prototype formula-style race car that would be faster, better handling, and more efficient than the previous cars. In addition to simulating a real world business situation, the RM24 will also compete in the Formal SAE® Michigan competition. The Formal SAE® Michigan is part of the SAE® International’s Collegiate Design Series (CDS), a collection of competitions created to take students beyond the classroom and challenge them to design, build, and test the performance of real vehicles. Not only do these engineering students gain valuable experience in the mobility-related industries, they also are exposed to business related functions such as budgeting, communication, project management, and resource management. We would like to wish Team Rensselaer Motorsport the best of luck at the Formula SAE® competition on May 8-11, 2019 at the Michigan International Speedway and we can’t wait to see the RM24’s results! If you are interested in learning more about the team visit their website or follow them on Facebook.